Congress | Over the line, Smokey! 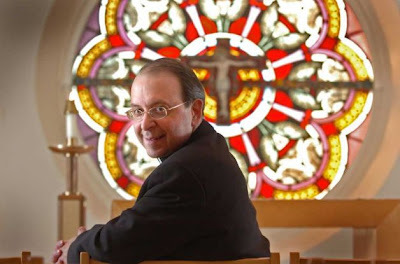 That is Bishop William Lori of Bridgeport, Connecticut. Despite the unfortunate photo, which looks like the last thing an altar boy sees before being taken into a booth for some private confessin’, Lori actually co-wrote the zero tolerance policy for child-f****** priests or, as it’s known everywhere else, “Wait, You Mean There Wasn’t a Zero Tolerance Policy for Child-******* in the Catholic Church Already?”. He’s also a warrior for all things churchy in this vile, depraved secular nation. … yesterday Bishop Lori testified, as part of an all-male panel, before the House Oversight Committee during its hearing on the Obama administration’s continuation of a Bush-era policy, already passed in 28 states, including being signed into law by Mitt Romney and Mike Huckabee when they were governors, that employers who provide health insurance for their employees, including businesses and institutions run by religious groups, with the exception of houses of worship, must include female contraceptive coverage. NY Times today has the story of how US drug manufacturers are pushing for a Supreme Court decision that would protect all manufacturers of products certified by the government. So, we want to be WORSE than the Chinese. The current case is a drug which was approved by the FDA, but in practice was stronger than it was supposed to be, resulting in complications. The Bush administration, as always, is trying to protect corporate interests from the public instead of vice versa, and so is taking the side of the company. The doctrine is called pre-emption, and it could be employed in a variety of cases, not just drugs, and regardless of carelessness or dishonesty.